14 décembre 2016 par Michèle T.	| Nos suggestions adultes. Genre(s) : Essay. This witty collection of essays recounts a lifelong love affair with books and language. For Fadiman, as for many passionate readers, the books she loves have become chapters in her own life story. Writing with remarkable grace, she revives the tradition of the well-crafted personal essay, moving easily from anecdotes about Coleridge and Orwell to tales of her own pathologically literary family. As someone who played at blocks with her father’s 22-volume set of Trollope (« My Ancestral Castles ») and who only really considered herself married when she and her husband had merged collections (« Marrying Libraries »), she is exquisitely well equipped to expand upon the art of inscriptions, the perverse pleasures of compulsive proof-reading, the allure of long words, and the satisfactions of reading out loud. There is even a foray into pure literary gluttony–Charles Lamb liked buttered muffin crumbs between the leaves, and Fadiman knows of more than one reader who literally consumes page corners. 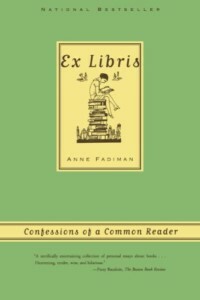 Perfectly balanced between humor and erudition, Ex Libris establishes Fadiman as one of our finest contemporary essayists.